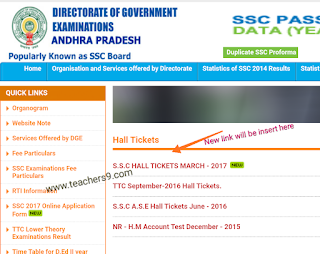 AP SSC/10th Class 2018 Hall Tickets Download now at www.bseap.org. SSC Public Examinations, March-2018 will be commencing from 15-03-2018 from 9.30 am to 12.15 pm. Hall Tickets have already been dispatched. The Hall tickets can also be downloaded from the following website from 08-03-2018 onwards. Students who have not received or lost the Hall tickets shall download the same from the website and get them attested by the Headmaster concerned. All the Chief Superintendents are requested to allow such candidates whose downloaded hall tickets are attested by the Headmasters of the schools concerned. They should also check up the particulars with the Photo Attendance Sheets. 5. Select a student name from the drop down list. 6. Enter correct date of birth. RRB ALP result for the first stage will display roll numbers of qualified candidates in the form of PDF file. The result for the first stage will be declared after normalizing marks of candidates. Based on RRB ALP result, candidates 15 times the number of vacancies will be selected for the second stage.